Well it is all over and what a spectacular ending! The final flight consisted of 4 tasks; a Fly In, a Minimum Distance Double Drop, a Judge Declared Goal and a Fly On. The MDDD and the JDG shared the same target, so pilots had to throw 3 markers at this goal. Going into the flight the scores between Top 3 (Yudai, Rhett and Joe) were close. However Joe and Rhett would have to pull out an amazing flight to take down the World Champion. It was another morning of great steerage along the river in the Utsunomiya valley. Pilots spread out across the valley to find their own launch points. On the first task, the Fly In, both Joe and Yudai scored sub 1-meter results, giving them points in the high 900s. Like all week there were a lot of great results on this target. Pilots had to then fly into the river valley and into the baseball field that we had been using as a common launch point. Pilots had to throw 3 markers at this goal, two for the MDDD and one for the JDG. Yudai came in first and scored 2 great results. From the edge of the field it looked like it was game over and Yudai would walk home with the big cheque. However Joe came in and absolutely smashed it. It was still going to be close. On the final Fly On, Yudai (still out the front of the pack) scored 1.25m. In a normal competition this would be a great result, but not here. A result over 2m on this task would only get you 600 points. Joe then finished off the flight with a 12cm drop and won the task. On returning to the competition center, there were a lot of people anxiously waiting for the scores of the morning to be calculated. Many people thought Yudai still had it, but there was a glimmer of hope in the eyes of Team Heartsill. When the results finally came out, Joe had taken out the competition by just 57 points. Yudai, who had held the number 1 slot all week, moved into 2nd. Rhett held 3rd place. Just like 1st and 2nd, it was going to be a close race for 4th and 5th. We, Team Scaife, went into the flight in 4th place however Masafumi Sato jumped ahead of Matt by just 37 points. It is worth noting that even though Yudai did not end up winning the event, he did win (by a huge margin) the 2014 Honda Grand Prix, of which Tochigi was the last stage. It was an amazing week and the level of competition was unprecedented. It was inspiring to watch these guys in action. It is a real shame that, after 16 years, this is the last time the event will be run in Tochigi. I was just glad I could be here to be part of it. Lets hope that one day competition ballooning will return to Tochigi. I think it is going to take me longer to write this post than we flew today. At the morning briefing, Les Purfield set 4 tasks in the Utsunomia valley. The weather report was looking a bit ordinary and they were expecting a change to come through at 8.30am. The tasks were a Pilot Declared Goal, Judge Declared Goal, Fly On and another Judge Declared Goal. They warned us that they might cancel a task via text message. When we got to the launch site, a baseball field by the river, we soon received a message to say the 4th task (JDG) was cancelled. After the green flag went up, the balloons flew at high speed down the river leaving the ground crews behind. Despite the speed, there were some impressive results on the first PDG, including a 10cm drop by Yudai and 38cm by Rhett. There were some good results at the JDG, which was on the side of the river. However, for the balloons that took off later in the launch period, the winds started to change and made it more difficult for them. If you look at the results for the final Fly On task, you will see that everyone struggled. With the way that the winds changed, there ended up only being one goal that pilots could declare. The winning result (by Joe Heartsill) was 676m. So 3000 points were determined in 30 minutes this morning. Two tasks were set for the afternoon flight; a Pilot Declared Goal and a Hesitation Waltz. Once again the weather was looking a bit quick, but they sent us out to the launch site. On arriving at the launch site, the wind was blowing and it didn’t look like it was going to subside. Les Purfield called a supplementary briefing and cancelled the flight. Yudai Fujita, Rhett Heartsill and Joe Heartsill all had really great mornings and have run away from the pack to hold the top 3 places. Matth Scaife is holding 4th place and Masafumi Sato is still in 5th place. Monday morning is the last competition flight, so lets hope for great weather and 5 more tasks. It was yet another day of great competition in Tochigi today. 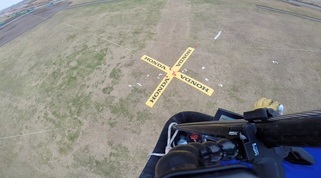 The morning was another flight in the Motegi hills and along the Naka River. The difference with this flight was it involved a very rare Fly In into the Twin Ring. The 5 tasks that were set were a Fly In, a Judge Declared Goal, two Fly Ons and another Judge Declared Goal. There was a lot of fog around the area, especially in the river. The teams were sent out to find their Fly In launch points, but were told to hold off launching until they received a phone message from the Director saying it was OK to launch. Once the message was received, all the balloons headed to the Twin Ring racetrack, but unfortunately the left hand steerage disappeared and only a handful of pilots got really close to the cross. However all the action was down in the foggy/misty river. The strong drainage winds made for some pretty tricky approaches to the first JDG, which was on the riverbank. Once again, there were many great results on the Fly Ons. One of the intersections (118) proved to be trickier than a number of pilots had hoped due to some very tall trees in the way. There ended up being 3 very solid ground contacts at this target as pilots tried to get down after crossing over them. The final JDG was in a tight little valley. All balloons had to do high drops because it was too quick to descend into the valley. Looking at the scores for the morning, it looked like the top 5 pilots all had solid mornings. The afternoon flight was a quick single Pilot Declared Goal in the Haga Valley. Pilots were able to select 3 goals, which proved to be a good thing for Joe and Rhett Heartsill. They both decided to set 2 goals using the lower winds and then set a back up goal that would rely on the winds at about 5000ft. As we were all packing up our balloons we could see the two Texas Racers rocketing up to the upper winds. Both decided to take the risk and go for their backup targets. The gambled paid off and Joe scored about 1m and Rhett scored 10m, giving them high 900 point scores. It was a gutsy move and all respect to the them for pulling it off. Once again there ha been a shuffle in the top 5. Yudai Fujita still holds the lead by 434 points. Joe Heartsill has moved up into 2nd place, followed by Rhett Heartsill. Matt Scaife slipped into 4th place and Masafumi Sato holds 5th place. There is three more flights to go and the top 3 spots could still go to any of the top pack. It is going to get very interesting over the next 2 days. What an epic day it was today in Tochigi. There are a lot of tired balloonists walking the streets of Japan tonight. The morning winds were very unusual this morning and very calm. At briefing, Championship Director admitted, “it was a little difficult to decide what to do this morning”. What he did do was set 4 challenging tasks in a new area at the Southern end of the map that no one had competed in before. The tasks were a Fly In, a Judge Declared Goals and two Fly Ons. After a long drive down to this new valley, the teams found that they had the choice of the approaching the first Fly In from the North on the lower winds or from the South on the upper winds. 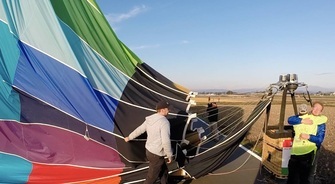 It seemed like an even split and most balloons were able to get near the first target, only to find that the crazy ground winds would test their patience. There were no exceptional results on this target, with the winning result being 9m. To get to the Judge Declared Goal, pilots had to sit just below the 4000ft ceiling for nearly an hour. Again, the winds at the target were very tricking and pilots had to pick the exact spot to make their decent from height. By the time most of the teams got to the JDG, it was getting pretty obvious that fuel and time limits were going to become an issue. The winds were still very slow and the two Fly Ons both had 2km minimums. The results of the first Fly On were all over the place. Some pilots managed to get good results, while others simply ran out of time and had to drop at the end of the scoring period wherever they happened to be. The final task was a real struggle for most. Limited intersection choices, slow winds, low fuel, limited time, tiredness and Golf Course sensitive zones all added to the stress. Only a handful of pilots managed to get results less than 100m. We have spent most of the day wondering why the results of the 2 Fly Ons took so long to get posted. However, now that they are up we can see why they took so long. There were a lot of penalties issued today. In fact, for the final Fly On, a third of the pilots received some sort of penalty. I highly recommend checking out the Task 11 results, as they make for an interesting read. After a very short break, we were back in the briefing hall ready to receive the next bunch of tasks. The afternoon flight consisted of a Pilot Declared Goal (2 goals permitted) and a Hesitation Waltz (with 2 goals). The winds were very gusty which made it very unpredictable. Again results were very mixed. Some of the pilots at the top of the rankings from yesterday ended up with some average results. We did not hear of anyone who thought they had a good day today. With all the mixed results in the 6 tasks today, there ended up being a big shake up in the top 5. A number of the Japanese pilots also slipped out of the top spots. Yudai Fajita continues to hold onto the top spot. Matt Scaife (and his awesome team… not that I am biased) moved up into 2nd place and Rhett Heartsill moved into 3rd place. The weather is still looking good for the next few days, so if today is anything to go by, we will be zombies by the end of the competition. Today was the first day of competition at the 2014 Tochigi Championship in Japan. The event has been running since the early 2000s and unfortunately this year is the final year the event will be run in the Tochigi area. Twenty-nine teams from 8 countries are competing in this year’s competition, half of which are from around Japan. The first flight this morning was the classic Tochigi competition flight. Championship Director, Les Purfield set 5 tasks, flying from the Twin Ring racetrack in Motegi and heading north to the Naka River. The flight consisted of two Judge Declared Goals, a Pilot Declared Goal, followed by another Judge Declared Goal and a Fly On. It was a very cold morning for this time of the year (30 degrees F), which meant there was very strong drainage wind down the river. All of the goals were peppered with markers and a lot of sub 1-meter results were scored. By the end of the morning, World Champion Yudai Fujita moved straight into first place with 4536 points. Rhett Heartsill was in 2nd place with 4027 points and Masafumi Sato in 3rd place with 3989 points. At the afternoon briefing, pilots were greeted with 2 markers on their tables. The flight in the Haga valley consisted of a Fly In task and a Watership Down task. The afternoon winds provided incredible steerage. The majority of the balloons took off to the South of the target, close to the 2km minimum distance. They then flew high and ended up approaching from the North East, essentially flying a box. The hare balloon took off from the Fly In target just as the first balloons were making their approach to the Fly In. The Hare flew for exactly 30 minutes and after flying a box, landed about 300 meters from where they launched. Many good results were achieved at both targets. At the end of the day, the top 5 shuffled around. Yudai managed to stay in the number 1 slot. Last year’s winner, Takao Mizukami, jumped into 2nd place and Masufumi Sato dropped into 3rd place. Only 500 points now separate the top 6 places. The weather is looking great for the rest of the event, so we can expect more than 20 tasks to be flown. So it is early days.